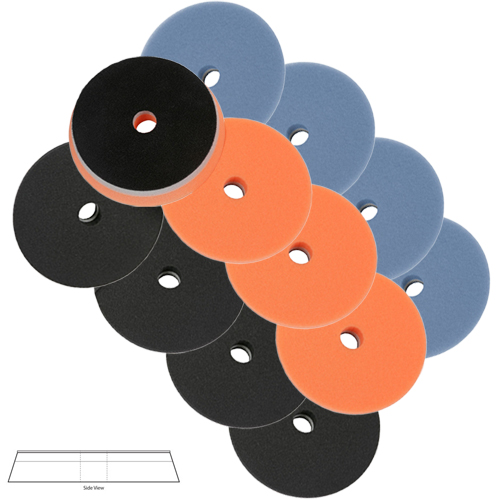 Lake Country HDO 5 1/2" Orbital Foam Pad Mix & Match 12 Pack is a great way to pick up one dozen pads of your choice in bulk for all of your cutting, polishing and finishing needs. All Lake Country HDO Orbital Foam Pads are made of a fine cell structure with firm to medium density for exceptional cutting, polishing and finishing. All Lake Country HDO 5 1/2 Orbital Foam Pads run 10% cooler thanks to the innovative cooling chamber and breathable interface and which prevents the center of the pad from concaving while polishing by allowing unwanted heat to escape. Lake Country HDO Orbital Foam Pads have been engineered from a durable, well balanced slim profile foam for longevity as well as efficiency. The breathable interface and multi-density layered foam design allows for a smooth polishing while maintaining the integrity of the pad for optimal surface contact, stability on flat panels and ability to adjust to contours. 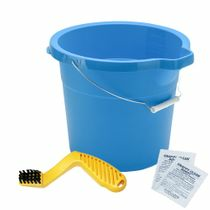 Lake Country HDO 5 1/2 Inch Indigo Blue Foam Cutting Pad: For medium to light compounding and heavy polishing. Firm to medium density and fine cell structure for superior cutting ability and fantastic finishing. Lake Country HDO 5 1/2 Inch Orange Foam Polishing Pad: For polishing and finishing on almost all paints. A great one-step pad that can be used for light compounding as well as polishing leaving a flawless finish. Lake Country HDO 5 1/2 Inch Black Foam Finishing Pad: For finish polishing paints including all black, dark, or soft paints and clear coats. This silky foam with a denser body creates the ultimate finishing pad. During Use: Use a pad cleaning brush to remove buildup of compounds and from your Lake Country HDO Orbital Foam Pads during your polishing process. After Use: Wash Lake Country 5 1/2 Inch HDO Orbital Foam Cutting, Polishing and Finishing Pads by hand or in a pad washer with warm water and Snappy Clean Boost Pad Cleaning Powder or a mild soap. You may also wash them by machine with a mild soap and warm water. Allow Lake Country HDO 5 1/2 Inch Orbital Foam Pads to air dry or dry on low or no heat in the dryer. DO NOT dryer sheets or fabric softener.